On True Meanings, the legendary Paul Weller turns folky and reflective in his most instantly satisfying work in years. 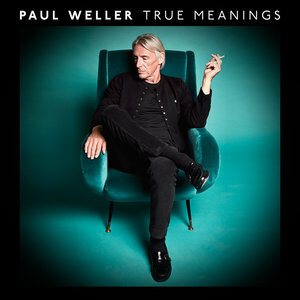 By themselves, any of the songs on Paul Weller's new album, True Meanings, would sound perfectly natural on any of his previous albums. He's no stranger to acoustic-based, string-enhanced arrangements. Albums like Wild Wood (1993) and the underrated Illumination (2002), among others, contain large swaths of gentle, rustic atmosphere. You could even go back 40 years to "English Rose", the lilting, elegant ballad he wrote and performed as a member of the Jam. But he's never really made an entire album in this vein – until now. Weller turned 60 earlier this year, and whether or not this milestone is directly related to his decision to make a more sophisticated, toned-down album is hard to tell. There doesn't seem to be much rhyme or reason to the musical decisions he makes (which is one of the things that makes him such a vital, exciting artist). If anything, he's gotten more daring and unpredictable over the last several years. His last album, 2017's A Kind Revolution, is an eclectic collection of funk-rock; his soundtrack to the British boxing drama, Jawbone – also released last year – was an ambient, trippy exercise; and in 2015 he released Saturns Pattern, a thick slab of bluesy hooks mixed with a bit of jazzy psychedelia. You get the idea. With every new Weller album, you can count on great songs delivered in whatever style he feels like diving into at that particular moment. For True Meanings, the genesis of the album was one particular song, "Gravity", which Weller had been messing around with for the past few years but couldn't seem to place effectively on any of his recent albums. In a sense, he built an album around that song. "Gravity" works well as a representative track from the 14 great songs on True Meanings. There's a simple, folky acoustic guitar laying the groundwork, while sumptuous strings – never overbearing – lift the song into emotional areas previously unexplored by Weller. And his voice, that burnished, soulful instrument of his, has never sounded better or wiser. "Golden lions in Golden Square / Salutations fill the air / Oh, gravity / It follows me / Wherever I go." The folk aesthetic runs deep through True Meanings, but it's complemented nicely by other genres. The gentle shuffle of "What Would He Say" has an easygoing, '70s AM radio vibe, complete with electric piano and trumpet lines straight out of a classic Burt Bacharach single. For someone whose primary influences include classic soul, a song like "Mayfly" is welcome comfort food for Weller fans. Still rooted in an easygoing acoustic arrangement, the song has a deeply soulful mood, aided in large part to a subtle-yet-effective horn section. By the same token, "Movin' On" is a wistful, breezy number that includes plenty of muted horns, accompanied by complex string arrangements reminiscent of Paul Buckmaster's early work with Elton John and the Rolling Stones. An interesting, eclectic group of musicians and writers have aided Weller on this album. The opening track "The Soul Searchers" gives a pretty good impression of that, as the song was co-written by Conor O'Brien of Irish folk band Villagers (who plays several instruments on the song) and Rod Argent of the Zombies stops by to play Hammond organ. Scottish musician and producer Erland Cooper is on hand as well, co-writing three of the album's songs with Weller: "Bowie", "Wishing Well", and "White Horses". The fact that these songs represent some of the album's high points isn't at all an indication that Weller is farming out his best work to outside writers; rather, it speaks to his ability to collaborate effectively. "Bowie", as its title suggests, was inspired partly by the death of the titular music legend, but also addresses mortality in general. "Do you know there's no journey?" Weller sings. "We're arriving and departing all the time / You are just mortal like me / God is only just a melody." Weller hasn't been much of a sociopolitical lyricist lately, certainly not to the extent of his tenure with the Jam ("Eton Rifles") or the Style Council ("Homebreakers"), but topical subjects creep up now and then, albeit in a more understated fashion. The gentle, gorgeous "Books", which features a good deal of Indian instrumentation – including Noel Gallagher, of all people, on harmonium – is a plea for love and sanity in a world gone mad. "Men changing laws / To suit themselves / To further their wealth / Men starting wars / Is there nothing more?" Harsh critics may call this approach heavy-handed, but Weller's simplicity and directness are refreshing. One could say that the deliberately paced, more sensitive approach Weller has taken with True Meanings is an indication that he's growing older and beginning to settle down. That certainly could be the case with most other musicians of his age and stature. And while a lot of the reflection in the lyrics is indicative of an artist taking stock, it would be ill-advised to think that this is what we should automatically expect from him in future releases. Knowing Paul Weller, he'll probably surprise us with something completely different next year. We should expect nothing less.